The Alamo Area Council has two Scout Shops in the area to provide for all your Scouting needs. This page just has basic information on the 2 locations. For more information on either, click their links (or pictures) to advance to their main sites. We are located at 2226 NW Military Hwy, San Antonio, TX 78213 inside the Alamo Area Council Service Center. 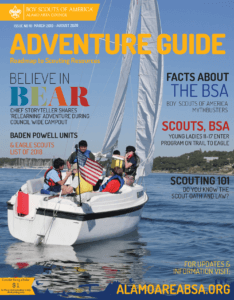 The Musselman Scout Shop is a National BSA Scout shop providing everything from uniforms, handbooks and leader materials to craft items, gifts, and Scouting apparel. The Musselman also carries items for Pinewood Derby, Space Derby, Rain Gutter regatta, and banquet items. We carry Eagle Scout gifts and all your camping needs. The knowledgeable staff has many years of experience in Scouting and can help provide Scouts young and old with just what they need. Please feel free to stop in and get a tour of the shop. with your list and give us a few hours to pull it for you. This service is not available on Saturdays or during our back to school rush (September 1 – October 31). ScoutReach Scout Shop is located at 8503 S. Zarzamora St, San Antonio, Texas 78224, inside the Alamo Area Council BSA ScoutReach Service Center on the Southside of San Antonio. The ScoutReach Scout Shop is run by the Alamo Area Council, so any closures that the council has, so does this store. Please always call ahead to make sure they are open. Don’t forget to specify that you are calling about the ScoutReach Scout Shop or you might get information about the Musselman Scout Shop.